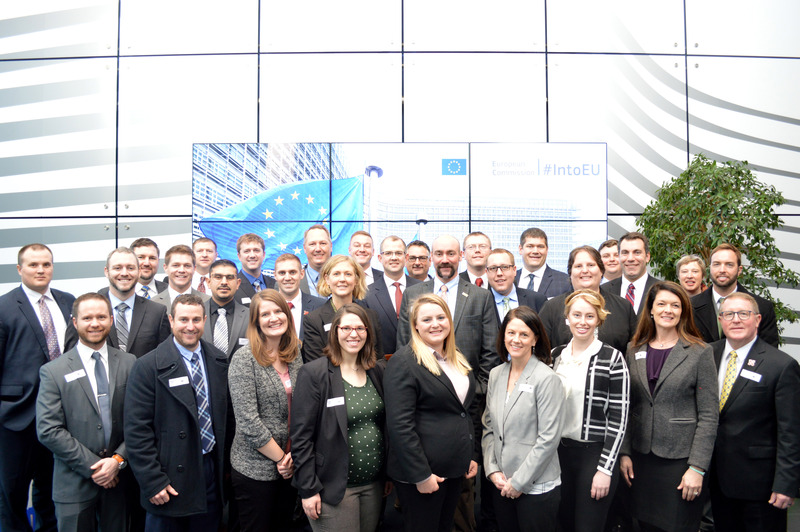 LEAD 37 fellows pose at the European Commission offices in Brussels, Belgium, during their recent trip. Twenty-nine Nebraska LEAD 37 fellows recently returned from an international study and travel seminar in the Netherlands, Belgium, Germany and Poland. “The seminar is designed to provide firsthand appreciation and understanding of our international community and the potential for people of all nations to work together,” said Terry Hejny, Nebraska LEAD program director and group leader. During the Jan. 5-20 seminar, fellows participated in briefings with Wayne Bacon, European consultant for the U.S. Grains Council; Francois Guerin, senior policy adviser for Copa Gogeca (united voice for farmers and cooperatives in the European Union in Brussels); Marek Beran, directorate general for agriculture and rural development at the European Commission; Mark Cropper, senior expert, agriculture and rural development at the European Commission; Maury Salz, president of Claas Omaha while at the Claas Corporate Offices in Harsewinkel, Germany; and professors Kathrin Toppel, Dorothee Straka and Henning Windheim, during a visit to the University of Osnabruck (Germany) and the Department of Applied Agriculture. The LEAD fellows also visited international businesses, entrepreneurs and several farms, including vegetable, fruit and row crop farms growing corn and wheat. There were also visits to the Port of Rotterdam (Netherlands); the European Parliament’s Visitors Center (Brussels); Bayer Monheim, Headquarters of the Crop Science Division (Germany); Bioenergie Park (near Osnabruck, Germany); Autostadt Wolfsburg, headquarters of Volkswagen; Checkpoint Charlie and the Berlin Wall Museum; the Wielkopolski National Park (near Poznan, Poland); the University of Warsaw Dairy Research Farm; and the POLIN Museum, where the fellows learned about the history of Polish Jews in Warsaw. The Nebraska LEAD Program includes men and women currently active in production agriculture and agribusiness. The two-year leadership development program is under the direction of the Nebraska Agricultural Leadership Council, in cooperation with the University of Nebraska-Lincoln’s Institute of Agriculture and Natural Resources. For more information, or to request an application for Nebraska LEAD 39, contact the Nebraska LEAD Program, 104 Agricultural Communications Building, University of Nebraska-Lincoln, Lincoln, NE 68583-0940; call 402-472-6810 or email leadprogram@unl.edu. The application deadline is June 15.